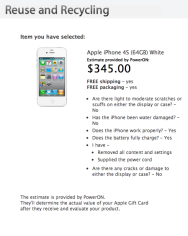 Apple is now buying back used models of its iPhone 4S as part of its Reuse and Recycle Program—a possible harbinger of the unveiling of the company's next-generation iPhone. 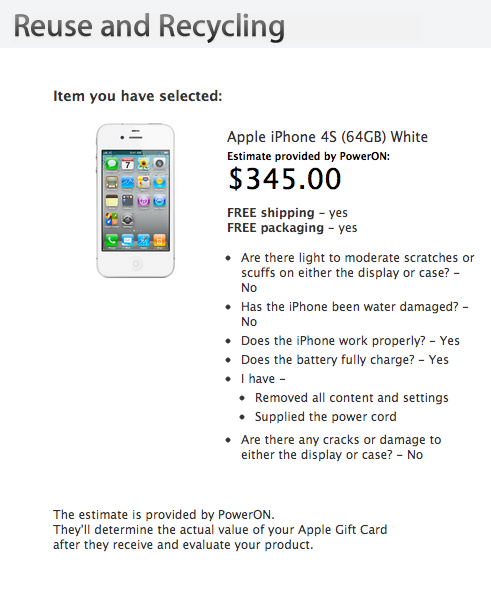 Assuming your iPhone 4S is in good condition, Apple will pay you anywhere from $285 for a basic 16 GB model up to $345 for a white 64 GB phone. That payout won’t be in cash, however: You’ll get a gift card that can be used to buy products—perhaps even the next iPhone model—at both your local and online Apple Stores. The buyback program was first reported by The Next Web. Although Apple hasn’t formally announced a “media event” to unveil the iPhone or any other new product, several media outlets have pegged Sept. 12 as the likely debut of the new model—news that set off a flurry of trade-ins as iPhone owners try to obtain the best price for their used models before buying anew. Users who wait until the next iPhone is launched may lose some money. Values usually fall as soon as a vendor shows a new model. Last spring, iPad 2 trade-in values dropped 23 percent after Apple unveiled the new iPad.